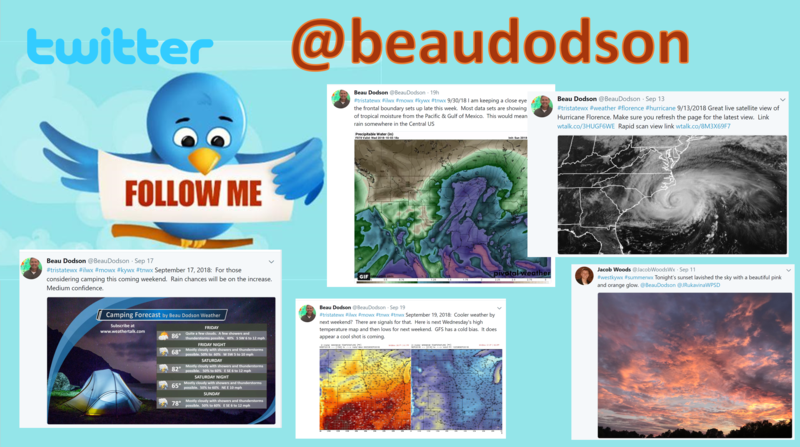 Scroll down for previous update, graphics, and comments, as well. Let’s take a look at the latest Hrrr future-cast radar. Green is rain. Blue is snow. Pink is a wintry mix. Keep in mind, the precip may begin as sleet and snow before quickly changing over to freezing rain and eventually rain. Use caution tomorrow morning. The first step could be icy. 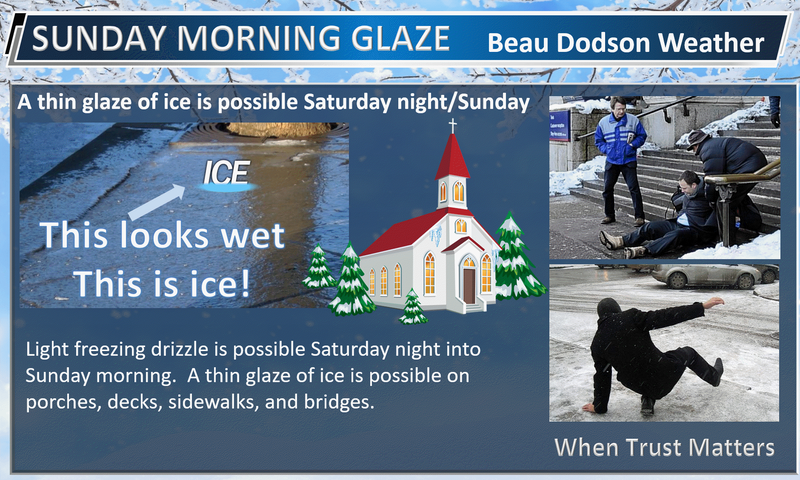 Freezing rain also may occur during church services. Model’s forecast. Won’t be exact but you do get the general idea on how temperatures should rebound as the warm front lifts northward. 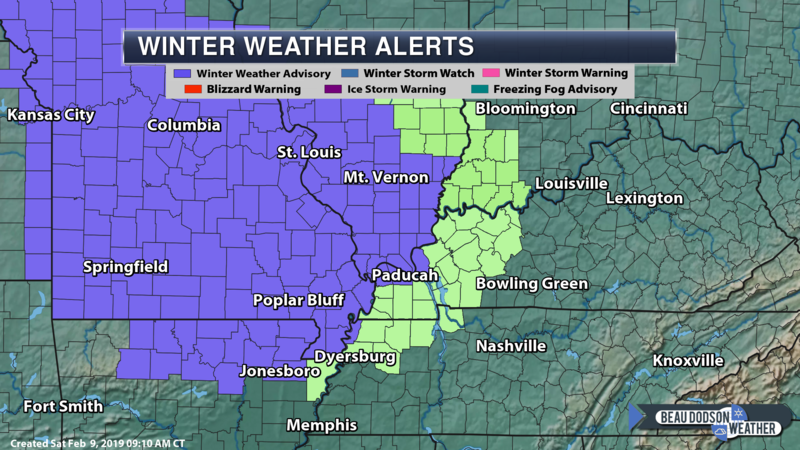 Additional counties have been added to the winter weather advisory. 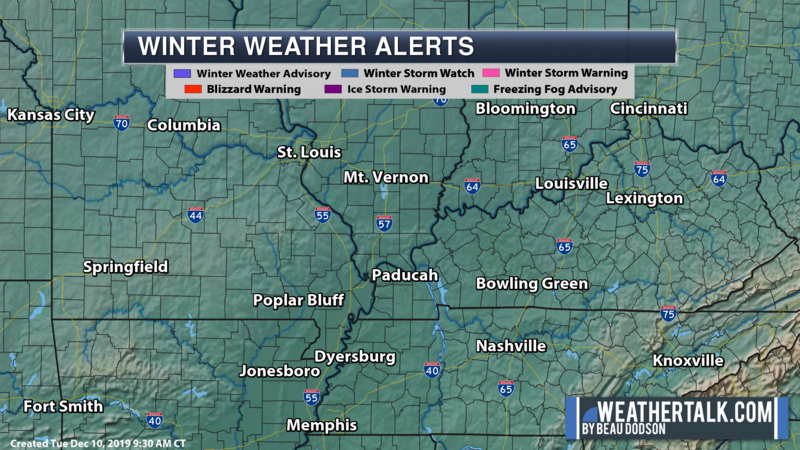 If you are not included in the winter weather advisory then monitor conditions, as well. 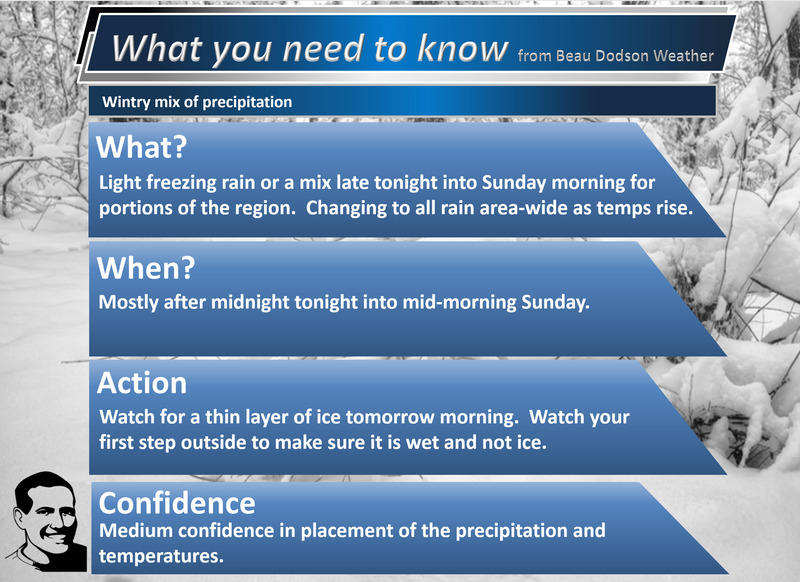 There could still be a period of a wintry mix at the onset of precipitation late tonight/tomorrow morning. Click here for an updated map (this map will not show the green zone). Plan on widespread rain Sunday afternoon into Monday night. Don’t forget that river flooding will continue well after the rain ends. Many rivers will exceed flood stage. 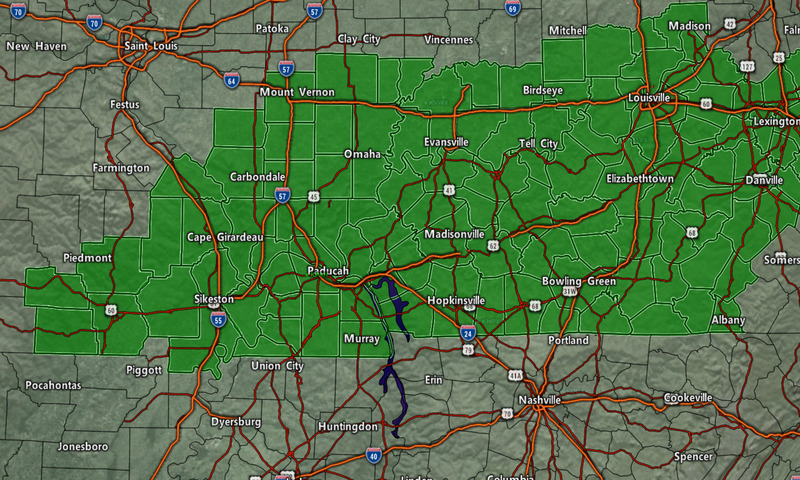 A flood watch blankets the region from Sunday night into Monday night. Additional counties may be added. Here is the initial outline of the watch. 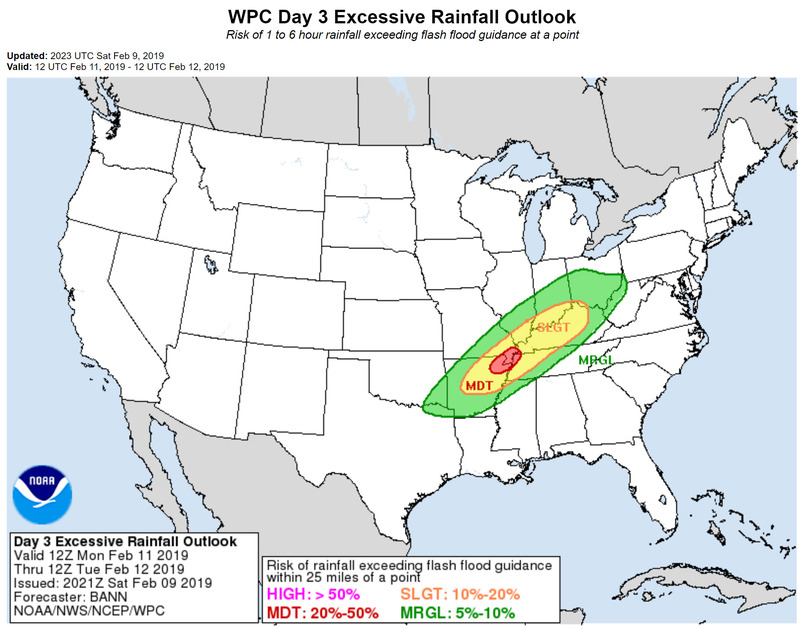 Bootheel and west Tennessee counties will also be included in the threat of flooding. Again, more counties may be officially added. 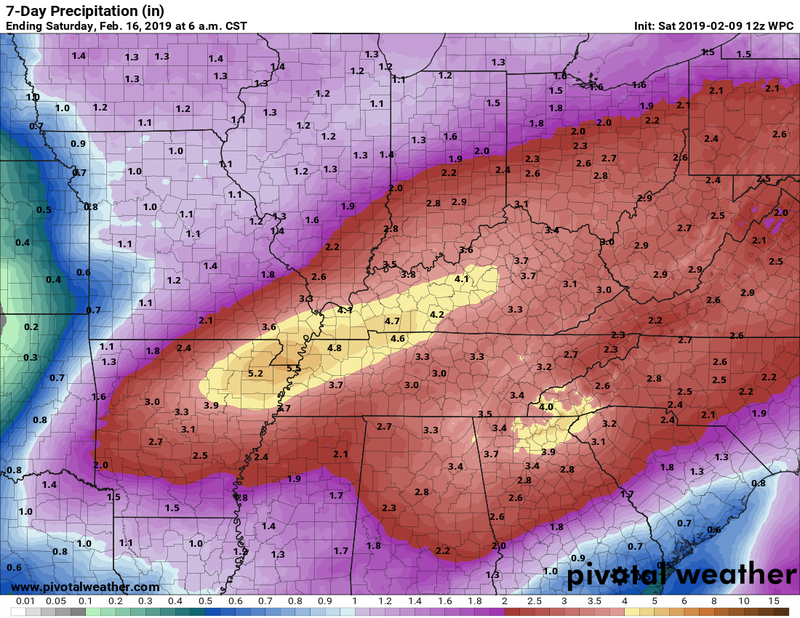 I already have MO/TN in flood concerns, as well. 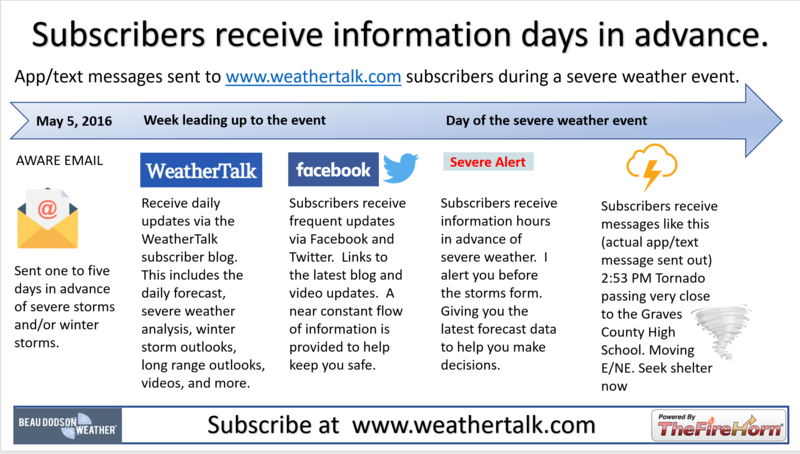 This is the NWS outline. 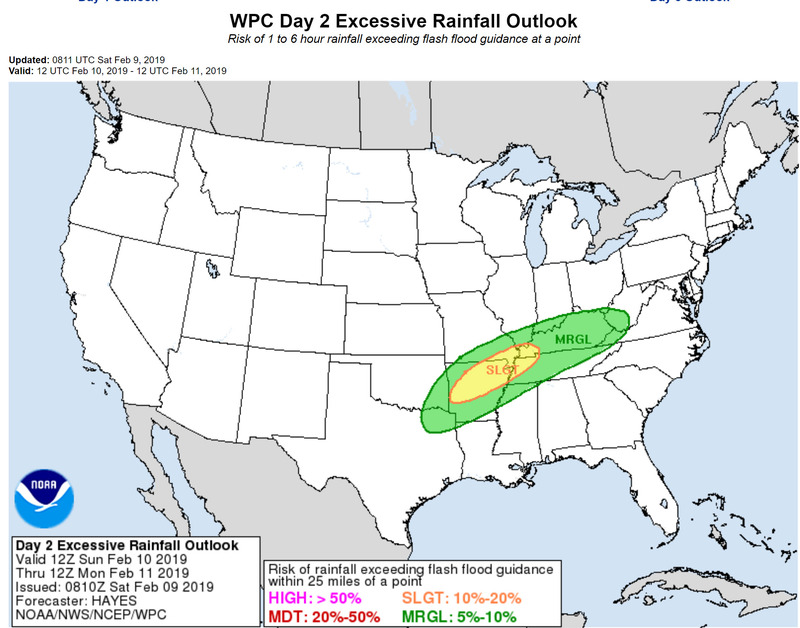 There is a marginal to slight risk and a marginal to moderate risk of flash flooding tomorrow and Monday. 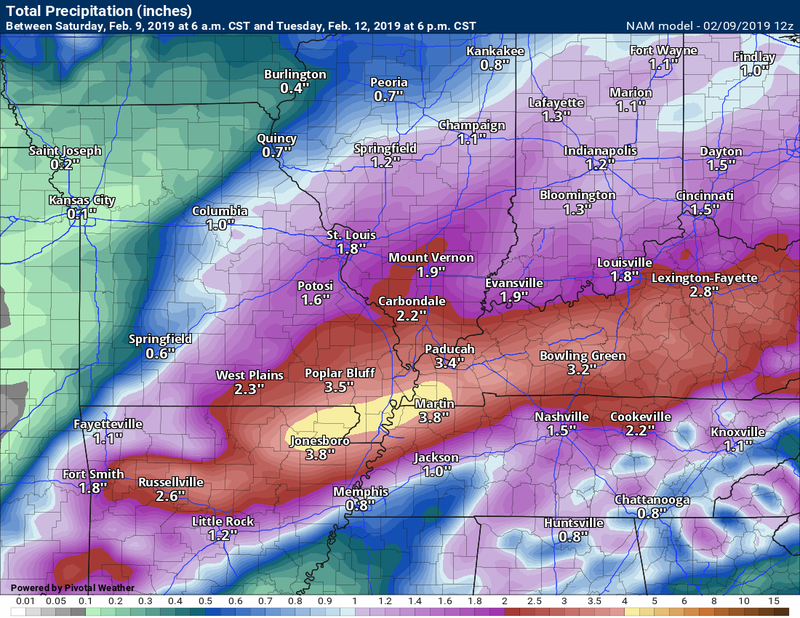 NAM rainfall totals. Do not get hung up on numbers. Look more at just how widespread this rain event is. 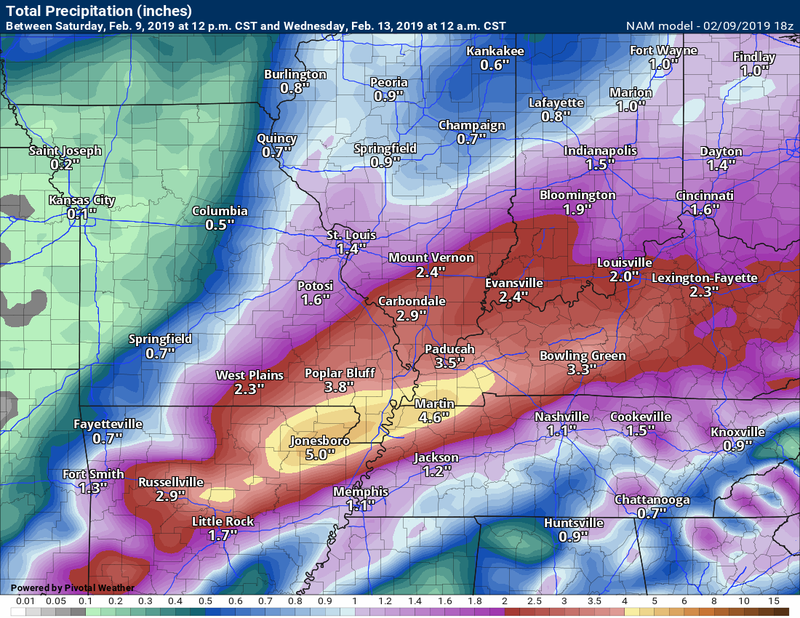 A widespread one to three-inch rain event. Pockets of three to four+ inches will occur. 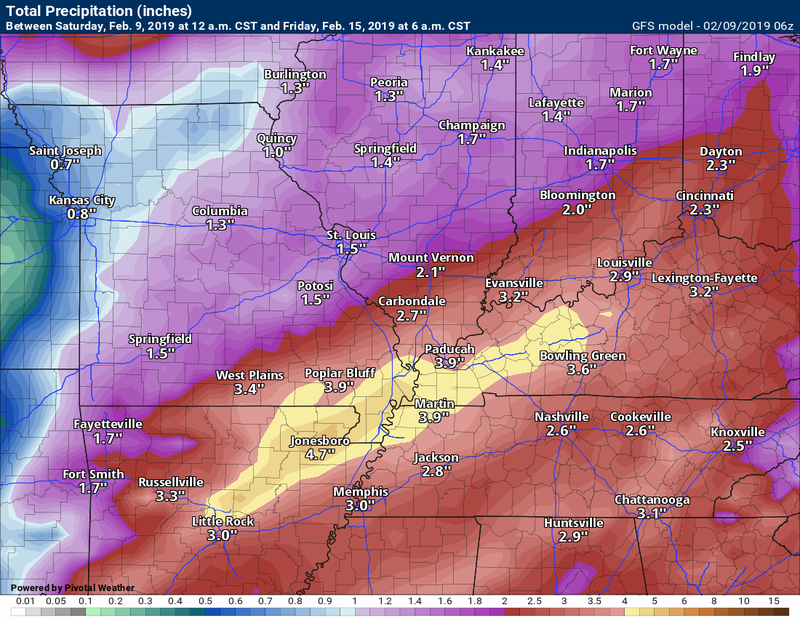 Additional rain is possible by Thursday and Friday. This is an active pattern and it will continue. Previous outlook below. Scroll down. We have two concerns over the next three days. The first concern will be a wintry mix that will develop late tonight (likely after 11 PM across southeast MO and then moving northeast from there) and especially during Sunday morning. This wintry mix may not impact all of my forecast counties. The risk is higher as you travel west and north/northwest. Light totals. This is not a storm that will cause any problems with power lines or tree limbs. Complete focus is simply on icy surfaces. 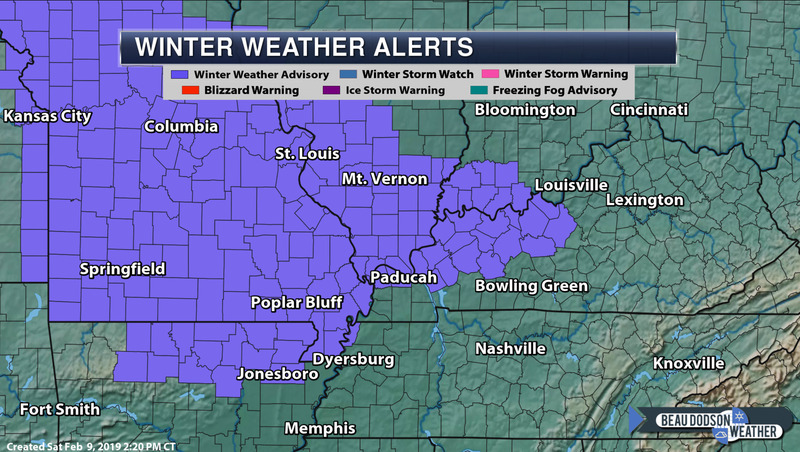 For now, these are the counties in the winter weather advisory for freezing rain and sleet (purple zone). This may need to be adjusted if the onset timing changes or temperatures change. The counties in green should monitor updates. They are currently not in an advisory. Click to enlarge images and animations on this post. It is important to remember that surfaces are cold. If rain falls then it will freeze upon contact. 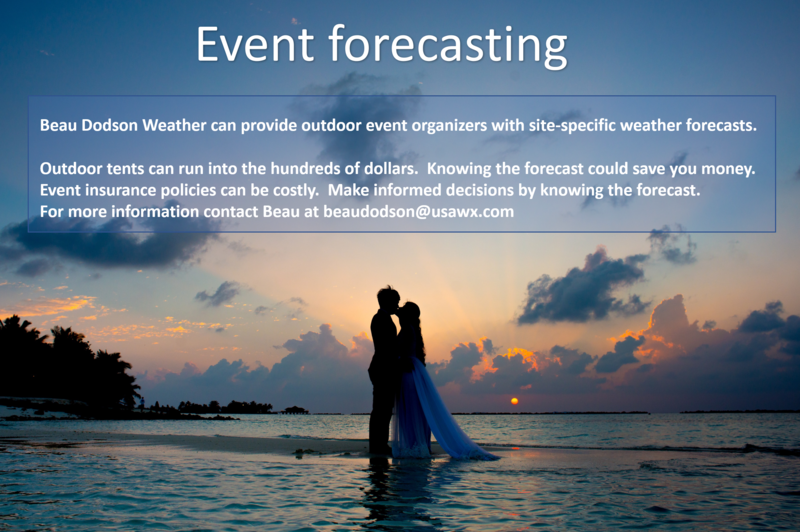 This could occur even with temperatures somewhat above freezing (it takes surfaces a bit longer to warm). 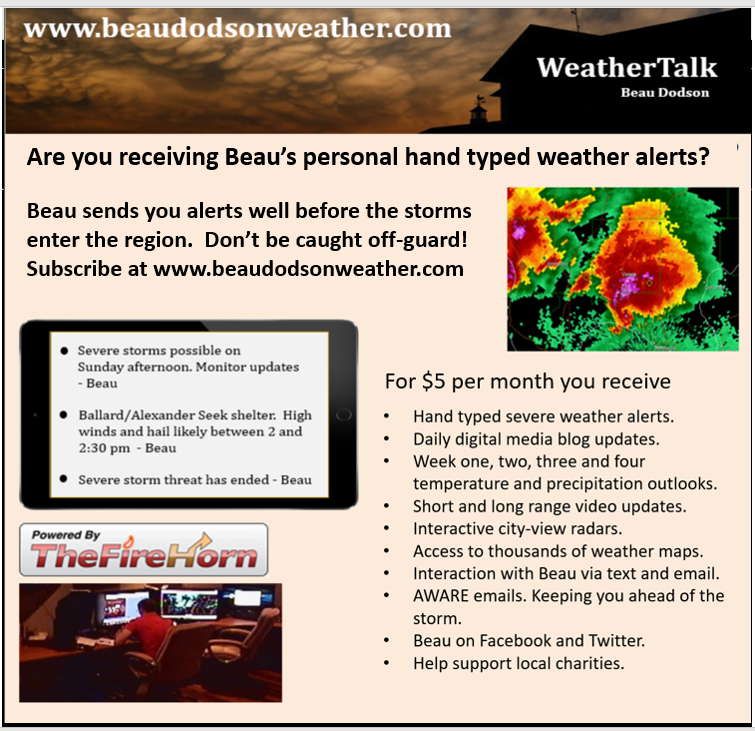 We are not forecasting a heavy ice storm. We are forecasting enough of a wintry mix to make roads, parking lots, and other surfaces icy for a few hours Sunday morning. Again, this may not impact everyone. There remain some questions about what time the precipitation arrives vs what time temperatures rise enough above freezing to change everything over to rain. The biggest concern may be during morning church services. Someone slipping and falling could break a wrist or injure themselves in other ways. 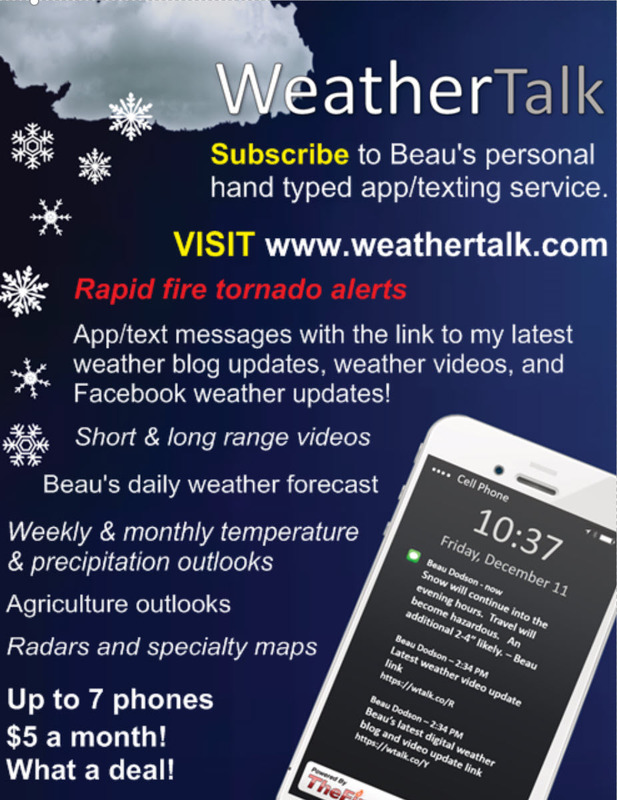 Historically, our deadliest winter storm events tend to be light freezing rain situations. 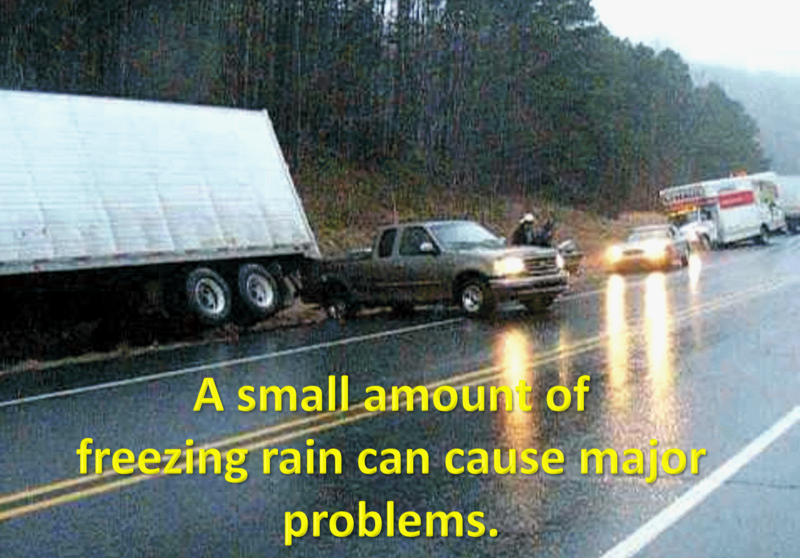 This is because people believe the roads are simply wet and it is actually a thin layer of clear ice. Cars and ice do not go together. Temperatures will rise above freezing area-wide as we move through the morning and afternoon hours. If you have travel plans late tonight and especially on Sunday morning then monitor radars and road conditions. Remember, that first step could be icy. Be prepared for patios, decks, driveways, and other surfaces to possibly be coated with a thin layer of ice. Let me show you a few computer model animations. These are the future-cast radar animations. Hrrr model first. NAM model second. Green is rain. Blue is snow. Red/pink/purple is a wintry mix. Notice that we change to all rain tomorrow morning into the afternoon. The concern is before that happens. A light wintry mix may make some surfaces icy. Again, some areas may not have to deal with any ice. Focus on impact and not amount. Some icy surfaces for some of my forecast counties. You can see the wave of freezing rain or mix push southwest to northeast across the region. 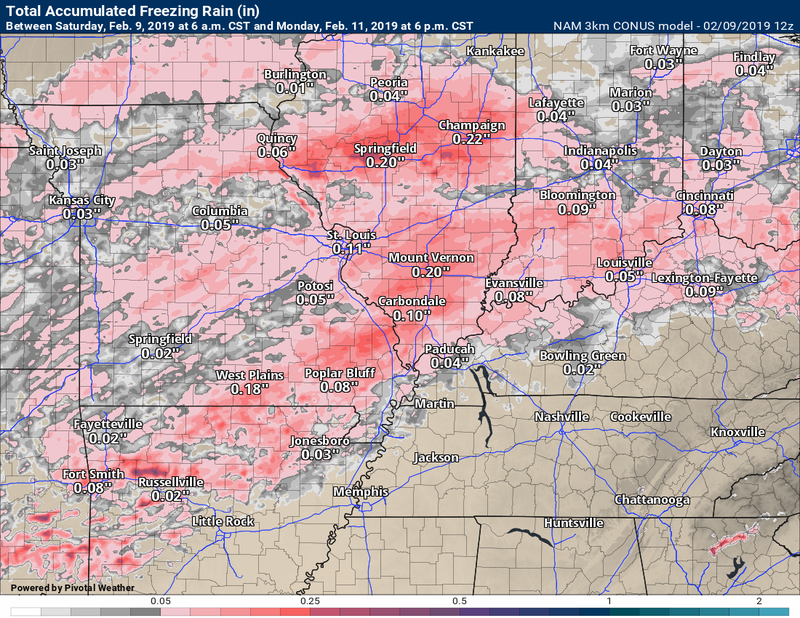 NAM has the freezing rain area a bit wider than the Hrrr model. The next big story is another widespread moderate to a heavy rain event. This is going to push flood waters even higher. Rain totals of one to three inches will be common with pockets of greater than three inches. Some type of flash flood or flood watch may need to be re-issued for this event, as well. 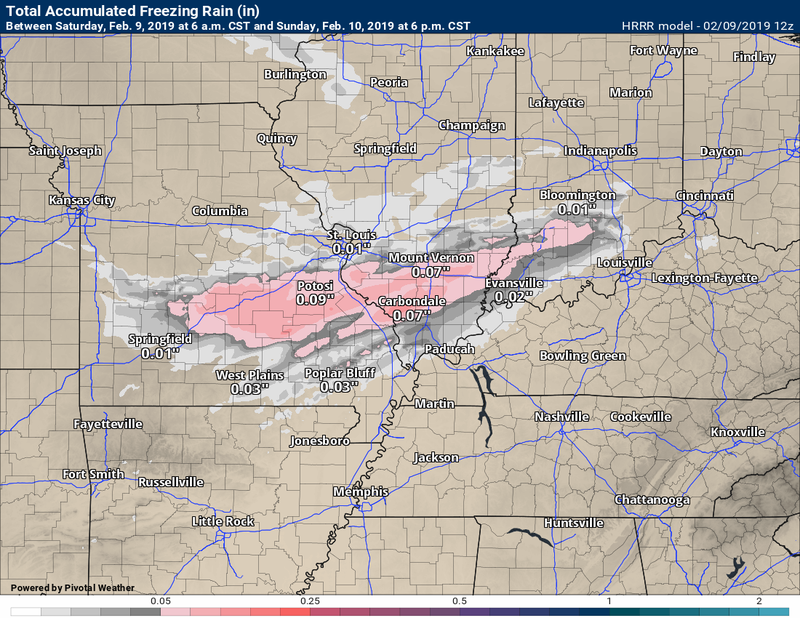 Future-cast radar from the GFS model. I stopped the animation at 6 am on Tuesday. Most of the rain falls before that time. Green is rain. Yellow is moderate rain. Blue is snow. Pink is a wintry mix. GFS model. Rainfall totals. This is what the GFS model expects. 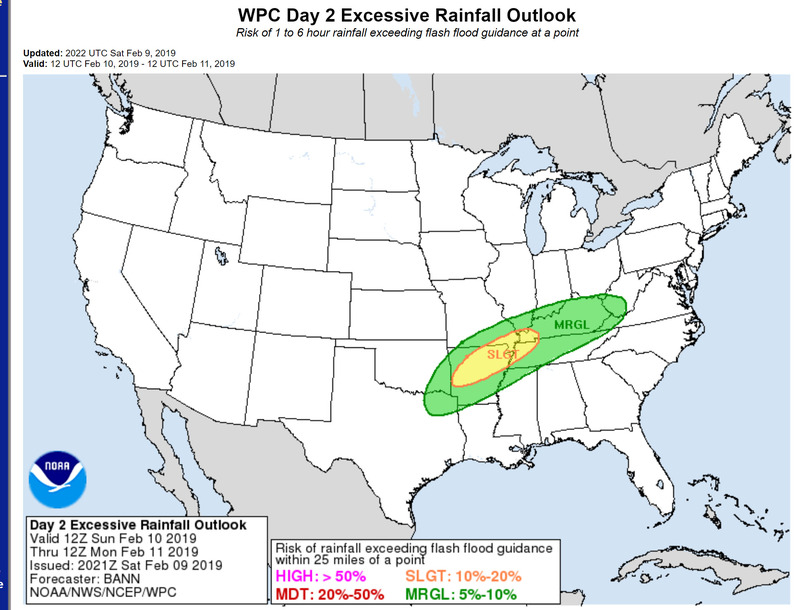 We have been placed in a marginal to a slight risk of flash flooding by the WPC. This covers Sunday and Sunday night. 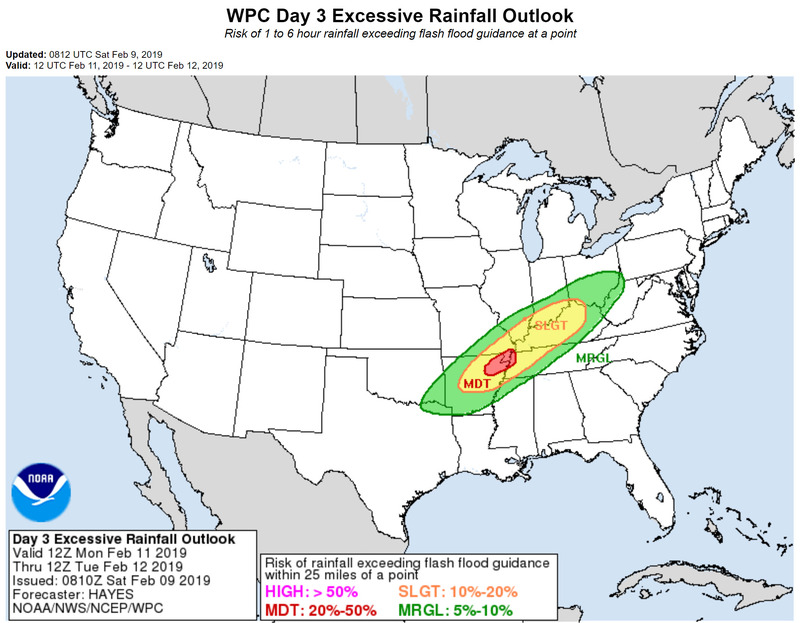 We have been placed in a marginal to moderate risk of flash flooding for Monday and Monday night.